9.9" x 7.9" stitched on 14 count. 7.7" x 6.1" stitched on 18 count. 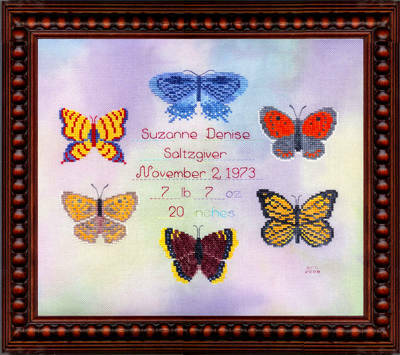 Butterfly Blessings cross stitch pattern... Baby announcement is surrounded by 6 real North American butterflies stitched with JAR Designs hand dyed floss on hand painted fabric. Alphabet and graph are enclosed for composing personalization. Primitive Pearls frame enhances the design.